I am not a morning person. In fact, I am the kind of guy who looks forward to that extra hour of sleep on the weekends and certainly dreads waking up in the wee hours when forced to take a morning flight. This poses a bit of a problem when it comes to photography. Not only do I miss out on the opportunity to take a decent picture at sunrise, but also miss out on the only time of day when one can avoid crowds at a famous tourist attraction. The former, I can’t really do much about. It is no coincidence that I take most of my pictures at sunset. For the latter however, there is a surprisingly simple solution. The key to this David Blaine-style trick is the camera’s shutter speed. Slow the shutter speed enough (upwards of 15-20 seconds) and anything that is moving within the frame, will not get recorded on the camera’s sensor. It is that easy! Here is a picture of the famous Louvre Museum in Paris. It was a busy Wednesday afternoon at the museum and swarms of people were wondering around the plaza near the famous glass pyramid entrance. Eager to take a picture, I decided to mount my camera on a tripod and closed my aperture down to F14. This gave me a meter reading of 25 secs – long enough to make everyone not standing still, disappear! Shot with my tripod mounted Canon 60D and my Sigma 10-20mm F4-5.6 DC HSM lens, at ISO 100, F14, at 25 sec. 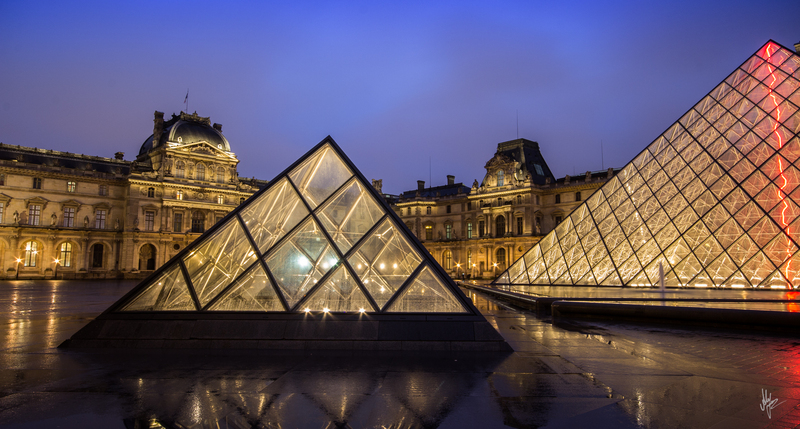 This entry was posted in My shots and tagged alexis thomas, disappear, France, glass, Long Exposure, Louvre, magic, Paris, photography, Pyramids by Alexis Thomas. Bookmark the permalink.